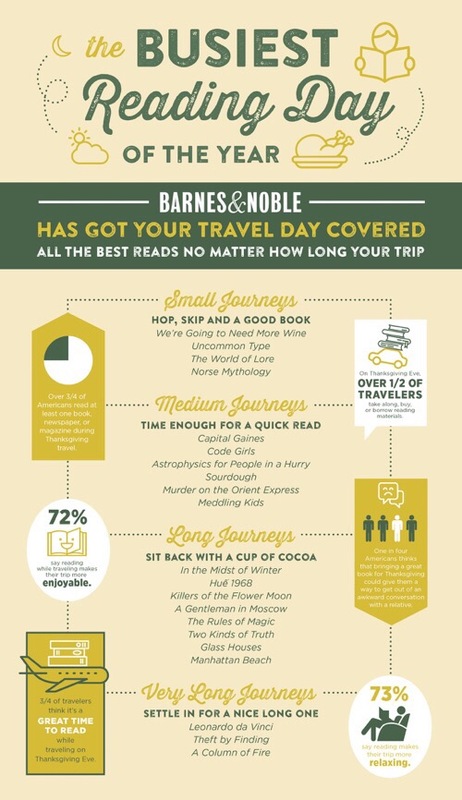 The day before Thanksgiving has been declared the busiest reading day by Barnes & Noble. They’re basing this fact on research done during a survey project they had done. 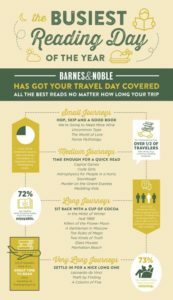 Their numbers show that more than 75% of Americans will read a book, newspaper or magazine during Thanksgiving travel this year and that more than 70% of them say reading makes their travels more enjoyable and relaxing. I always travel with a book and magazines. I often leave my magazines at the airports, on planes and such. I guess I hope the next passenger will appreciate the magazine as much as I did, but maybe they just think “how rude!” of me for leaving my used magazines laying around. I’ve even stumbled on BookCrossing books in the past. Even though I was not interested in reading either, I thought it was awesome that someone would pay money for a book and then leave it out so that serendipity can play a hand in landing it in the lap of another reader. I’ve yet to leave a BookCrossing book out and about, but I probably should. 25% of Americans think bringing a great book for Thanksgiving could get them out of an awkward family conversation. I’d have to think about that one. I’m picturing sauntering into dinner with some kind of book holster (is there such a thing?) clipped to my belt, ready to draw my paperback at the first sound of an uncomfortable topic of conversation. Today, I picked up Matthew Weiner’s (the writer/creator behind the TV show Mad Men) first fiction book Heather, the Totality and it’s only 138 pages. I’m not sure that’s long enough to keep anyone out of many conversations. Hope you’re planning on reading something good next week. This year’s National Book Awards will be broadcast live over Facebook (as well as on their website) on Wednesday, November 15th, starting at 6:20pm CST. But then they’ll roll pre-recorded videos of the finalists reading, during the dinner portion of the gala, and then pick up the live broadcast when they’re done eating to begin handing out the actual awards. Last year’s awards were fun to watch, with Colson Whitehead winning the 2016 fiction prize for The Underground Railroad, and this year’s evening looks to be brimming with more bookish greatness. It looks like all you have to do is click over to the National Book Foundation’s Facebook page to watch the event. I watched last year on the foundation’s site, but this year it looks like they’re going after a more social-share plan. They even made a PDF ballot to download so you can play along at home. They are @nationalbook on Twitter and they are using #NBAwards as the official hashtag for the 2017 event. Hopefully it’ll work. It’d be fun if people outside of the industry started tuning in and looking forward to these awards. There are four awards being handed out, one for fiction, non-fiction, poetry and young adult literature. I’m anxious to see this year’s winners as out of all 20 books nominated – I have only read Jesmyn Ward’s Sing, Unburied, Sing. And if one of the other fiction finalists is deemed better than that one (which was a great read, though I appreciated her Men We Reaped more.) I certainly want to read it! This past weekend CBS Sunday morning aired a piece on the success of Ann Patchett and her bookstore in Nashville, TN. During the seven and a half minute story they covered everything from bookstore dogs, the launching of new independent bookstores, author tours and even Ann Pachett’s writing style. Here’s a link to the video. It’s better to click through and watch as CBS has all their embed stuff set to auto-play and I’m not going to do that to you. When you’re done watching the video, you can click on through to Ann Patchett’s shop’s site and browse as well. Though I can attest, it’s much more fun to visit Parnassus Books in person. I think CBS Sunday Morning should highlight an indie bookstore every couple of weeks. I feel certain they’d get all of the colorful characters, commentary and quirky video they like to have these days. Anyway, it’s a fun little interview to watch while finishing your morning coffee this week. This weekend book lovers and writers from around the Southeast will be in Montgomery, AL for the 12th annual Alabama Book Festival. Here is the full schedule. 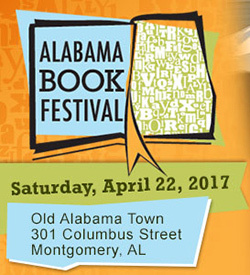 This free event is held at Old Alabama Town, which really sets it apart from other book festivals in the region. It’s a great location with interesting buildings and lots of front porches on which to chat up authors. The Alabama Book Festival officially opens at 8:00 a.m. and will close around 5:00 p.m. The lineup is quite extensive this year with more panels and poetry folks than I remember from years past. Joe Haldeman (Venue C at 3p-3:45p) – this guy is a legend in the sci-fi circles. He’ll be on a panel discussing graphic-novel adaptations of books. His book The Forever War is one of my all-time favorite sci-fi reads. The Outdoors Panel discussion (Venue C at 11a-11:45a) – I recognize a couple of the travel writers here. They’ve done some good books. Kyle Stevens (Venue B at 10a-10:45a) – Stevens is heading up the Social Justice Panel discussion. So many good books in this category over the past two years. The discussion is going to be worthwhile. Cassandra King (Venue E at 11a-11:45a) – Her works include The Sunday Wife and The Same Sweet Girls. Winston Groom (Venue E at 3p-3:45p) – Best known for writing Forrest Gump. There are other panels throughout the day including Cozy Mystery, Dark Mystery, Kid’s Picture Books, Comics, Romance, Military History, Food and Spirits, and more. There are also a few workshops for writers. I think these are all free as well, but you do have to register online as the seating is first-come, first-served. The only thing really missing this year is Capitol Books. They closed down last year and won’t be there cheering on the authors and manning the Bookshop Tables. Books will still be available for sale though, as Barnes and Noble will be stocking the tables this year. If the weather is anything like the past two weekends, it’s going be a great day for a book festival.